Pin Hole rubber tile Model No. : FST0307 Size: 500*500mm Thickness: 25-90mm Color: Red, green, blue, black, grey, could be customized. Material: 100% recycled rubber granules Package: By Pallet and Warped with Plastic Film 1. Integrated connectors allow fast installation with loose lay, n..
Acoustic rubber tile Model No. :FST0308 Size: 500*500mm Thickness: 30-50mm Color: Red, green, blue, black, grey, could be customized. 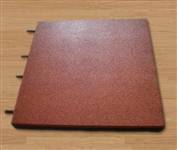 Material: 100% recycled rubber granules Package: By Pallet and Warped with Plastic Film 1.With Europe Standard EN1177. 2. Supply OEM service 3. 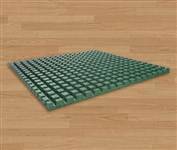 Safety, Envi..
Safety rubber tile Model No. :FST0308 Size: 500*500mm Thickness: 25-90mm Color: Red, green, blue, black, grey, could be customized. Material: 100% recycled rubber granules Package: By Pallet and Warped with Plastic Film 1.With Europe Standard EN1177. 2. Supply OEM service 3. Safety, Envir..